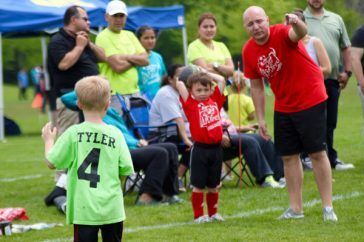 The Des Plaines Park District Lil Kickers and Juniors Soccer Leagues are recreational leagues for boys and girls. The park district is proud to be an affiliate of the Illinois Youth Soccer Association. 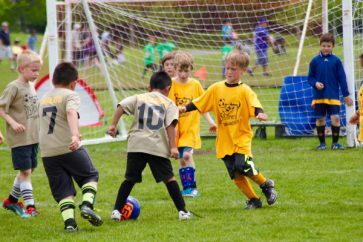 Our Youth Soccer Leagues emphasize player skill development, coach and referee training, parent safety awareness, and a safe environment for your child to enjoy the game of soccer. Teams in the Youth Soccer Leagues are gender specific and age appropriate if enough boys and girls register for each age group. Age groups with low levels of registration may be combined with the other practice location, or into a co-ed team, to fill the team roster. All participants will receive a phone call from their coach prior to the first practice. If you do not receive a call, please understand that we are recruiting volunteer coaches. If you do not receive a call by 8/26, or if you have any questions about the program, please call Josh Cantres at 847-391-5711, or email jc@DPParks.org. Includes a uniform for each player. Includes the required soccer shirt. Online Registration ends at 5:00pm on August 21. Registrations taken after August 21 will be added to the waitlist, if space is not available. All practices for Fall 2018 begin the week of August 27. Choose the most convenient neighborhood practice location from the chart below or download a PDF. Complete information about the program is always online and in the Spectrum Program & Event Guide. Players in the Pre-K thru 1st grade level will practice for 30 minutes and then play a 45 minute game on Saturday mornings. All other grade levels will practice twice a week. Location, time and day are at the discretion of the volunteer coach. Please note: If registration is low in your practice area, you will be moved to the next available practice area where we can complete a team. Games are scheduled from September 8–October 20, on Saturdays, hourly from 11:30a–4:00p, depending on the number of teams. All games are played on Prairie Lakes Field, and are called by USSF and IHSA certified officials. All participants provide their own shorts, sweats, shoes, and required shin guards. A Lil Kickers uniform or a park district issued soccer shirt is required attire for games. Players must bring an initialed soccer ball to practice: a #3 ball (4–5 year olds), #4 ball (1st–5th grade), and a #5 ball (6th–8th grade). Youth Soccer Leagues team pictures are taken before your practice. Details and order forms will be handed out prior to the scheduled date. Due to the complications that arise from late withdrawals after the formation of teams, there is a $20 processing fee applied to any refund requested after the August 21 registration deadline.